Harvey has strengthened to a Category 2 hurricane, with maximum sustained winds of 100 mph, according to the National Weather Service Forecast Office in Corpus Christi, Texas. Highways in Texas filled with cars Thursday into the night as coastal residents made their way north and out of the path of a hurricane that forecasters say will bring "life-threatening" amounts of rain. Some areas could get as many as 35 inches of rain from Hurricane Harvey and many will get more than a foot, forecasters from the National Hurricane Center said. As Harvey gained strength Thursday, residents along the Texas coast made the choice to evacuate or stay. Those staying in place aren't taking any chances; they're filling sandbags, stocking up on water and boarding up windows. Harvey is rapidly becoming more powerful and is forecast to become a Category 3 hurricane with winds of at least 111 mph by the time it hits the middle Texas coast late Friday or early Saturday, the hurricane center said Thursday. After hitting Corpus Christi, the storm is expected to stall over the state, forecasters say. In Corpus Christi, where Harvey could make landfall and Mayor Joe McComb has issued a voluntary evacuation order, Walmart shelves were clearing quickly, as the city canceled Friday's dockets in city court and provided self-serve sandbags to residents. 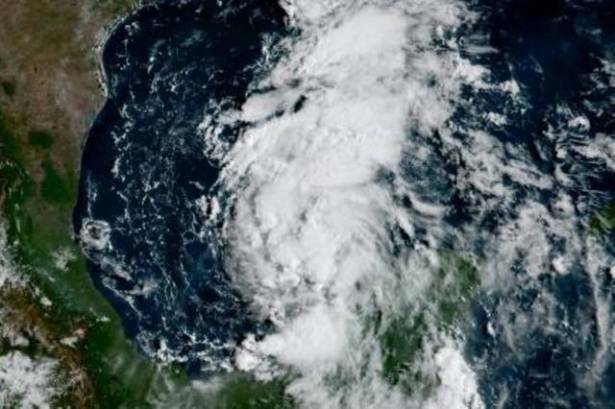 Hurricane-force winds are a concern as the storm builds strength in the Gulf of Mexico, and a potential deluge and subsequent flooding may be a big danger as well, according to meteorologists.